With a burst of innovation from new companies and products and the renaissance of handcrafted, traditional instruments, NAMM members from around the world come together in record numbers to prove once again that music is the original social network. Carlsbad, CA (January 26, 2015) – As the music products industry returns home to 100 countries worldwide, they leave the 2015 NAMM Show empowered with fresh ideas and products to amplify the power of music. Held January 22-25, NAMM welcomed a record number of exhibitors to Anaheim. Major product debuts, a bumper crop of new-to-NAMM exhibitors paired with engaging thought-leaders created what many NAMM members called the freshest NAMM Show in years. As the number of musical tribes attending NAMM expands, this year’s edition grew to the largest and most inclusive event in the National Association of Music Merchants’ (NAMM) 114-year history. A record 1,621 exhibiting companies brought their entrepreneurial spirit to Anaheim. That energy was palatable, as the show saw a 6% increase in exhibiting companies over 2014’s event making for the largest NAMM Show exhibitor line up ever. A mix of NAMM member buyers, exhibitors and their invited guests, NAMM’s Generation Next and Music Education Day participants (college music students and school music teachers) along with media resulted in in a record 99,342 NAMM Show registrants, the largest gathering in NAMM Show history. An 11% increase in international registration and a 2% increase in buyer numbers also made it the most diverse. Even NAMM Show vets with decades of exhibiting under their belts hopped from their booths to note the heavy stream of buyers. “Our traffic flow has been much higher than the last few years, and while attendance is clearly up these are quality visits, not just quantity. Dealers are here to make decisions on purchases, see what’s new, but also to learn about ways that we can help them grow,” Terry West, president and CEO of Pearl Corporation. For buyers worldwide, NAMM is the ultimate music store with limitless opportunities for growth. “I tour the show floor imagining that I am a customer in my own shop—what things jump out at me—because if it evokes a reaction in me, chances are it’s going to evoke a reaction on the part of my customer,” said Monster Music’s Brian Reardon of Levittown, NY. The number of new exhibiting companies more than doubled from 2014, as 331 companies showed at NAMM for the first time. These new brands made up 18% of the total exhibit count, bringing a fresh sense of wonderment to the NAMM Show. “We’re seeing innovation and change everywhere – especially at this year’s NAMM with the big guys releasing major new products and the infant industry of brands we’d never heard jumping right in the mix with them. Many products are going back to the old school, touch-sensitivity. People are here turning knobs and using instruments outside of the computer,” Peter Dods, Owner of Easy Music Center, Oahu, Hawaii. Part of the hands-on resurgence Dods refers to can be credited to the hundreds of modular synthesizer brands popping up throughout the show. “It’s our first time showing together as a community. We are here to personally educate people that are interested in modular synthesizers, so that it’s not too intimidating. Products like modular synthesizers you have to see in person to make a buying decision,” said Cyrus “Cyrusrex” Makarechian, owner of MuffWiggler. NAMM opened to a flurry of headline grabbing product announcements from exhibitors including Korg, Moog and more. Avid used the NAMM platform to make a major announcement on day one. “We’re able to see all of our audiences at NAMM from students to studios to major media companies, engineers and producers,” said Jennifer Smith, CMO, Avid. To amplify their reach across NAMM audiences Avid featured demos with musical icons including Dave Mustaine, Butch Vig and Randy Jackson. The world’s most prominent retailers travel to NAMM to forecast trends. “Compared to 10 or 20 years ago, there is an increasing presence of new areas besides traditional music. You can feel the change of the music scene every year by coming to the show, and you can convey that change to the retail customers in the Japanese market. That is why I come to the NAMM Show every year,” said Mototsugu Shimamura, Chairman of Shimamura Music Corporation, Japan’s largest music instrument retailer. Iconic guests shared insights that the industry will be quoting for years to come. 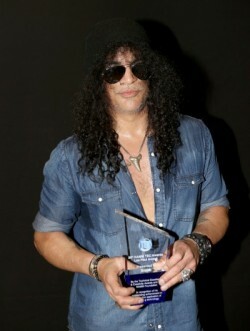 Where other than NAMM does the day start with Woz and close with Slash on the same stage? Apple Co-founder Steve Wozniak shared passionate insights laced with humor to the best-attended NAMM U session in history. Chris Stuenkel, a buyer for Austin bazaar noted that Woz’s session “Inspires you to see what you can do, what a big impact you can have.” Moby not only picked up the Music For Life Award, NAMM’s highest honor, but also shared straightforward thoughts on the creative process with college students. 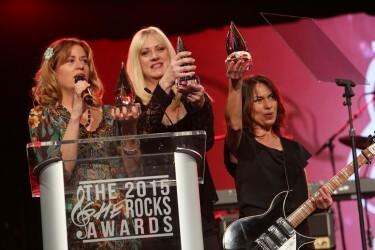 Evening award events from the 30th Annual NAMM TEC Awards featuring Slash and Nathan East to the She Rocks Awards featuring Colbie Caillat and The Bangles added to the star-studded trade show’s allure. As Woz said during his breakfast chat with Joe Lamond, “Music is like a magic dust bringing love to people.” The industry returns home from a busy NAMM Show with a sprinkling of magic dust, and a renewed love for the business of music. Keep the momentum going in Nashville when Summer NAMM returns to the beautiful Music City Center July 9-11. Global growth opportunities abound at NAMM Musikmesse Russia, September 10-13 and ProLight + Sound NAMM Russia, September 10-12. 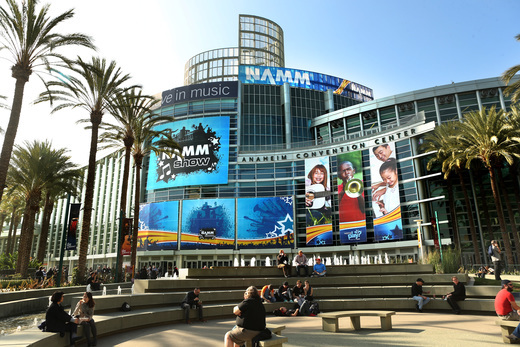 The NAMM Show returns to Anaheim January 21-24, 2016.